The next-generation Hyundai Elantra is 53 percent advanced high strength steel, 35 percent more than the 2015 model, Hyundai said Wednesday as it unveiled the 2016 model year in South Korea. The precise breakdown of the Elantra’s steel content wasn’t immediately clear, nor were the locations of the harder, lighter stuff. Typically, one can find it in locations like the A-pillar, B-pillar, roof rail and sill. U.S. product public relations senior group manager Jim Trainor wrote in an email Wednesday that the U.S.’ 2016 Elantra will be unveiled in November and hit our country in early 2016. The version unveiled Wednesday was actually the South Korean Elantra (known there as the Avante). The car is anticipated to sell 50,000 in Korea in 2015 and 110,000 there next year. Overseas, they expect to move 590,000 Elantras. Last year, Hyundai sold 222,023 Elantras in the U.S.
“I would recommend you wait until the U.S. version is out to learn about all the changes,” Trainor wrote. Every automaker is going to have their own procedures for different grades, but for a rough idea of how repair procedures could change, check out Honda’s instructions for the higher-strength steel in the 2015 Honda Fit. Also, see how things can go wrong if you don’t follow the OEM’s recommendations with this Honda demonstration of a botched ultra-high-strength steel repair. Those curious for more about joining and replacing advanced materials like high-strength steel, aluminum and carbon fiber should check out “Removing, Replacing and Joining Advanced Materials” with Dave Gruskos of Reliable Automotive Equipment at the SEMA Show as part of the Society of Collision Repair Specialists’ Repairer Driven Education series. Register here. Hyundai said the car has auto-braking, known formally as Autonomous Emergency Braking (AEB). On the 2016 Elantra, the car will alert you, start to prepare the brakes and then stop itself if you’re about to hit something while exceeding 6 mph. The technology had already been an option on the American 2015 Elantra; Trainor wouldn’t reveal if it’ll be standard or an option in the U.S.
Other features on the Elantra include high-beam assistance and a rear cross-traffic alert (for when you’re backing out into the street). The car also offers a blind-spot alert with lane change assist, which tells you if a car is in your blind spot or oncoming in the other lane when you’re trying to change lanes. 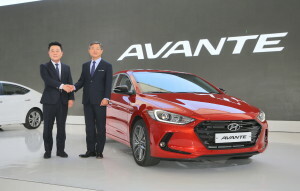 “The All-new Elantra incorporating Hyundai Motor’s full capacity will not only provide innovative experiences and values to customers worldwide but also lay the foundation to regain momentum amidst difficulties surrounding the automobile industry,” added Yang. Also, for those of you who fix a lot of rear-ended Elantras, the car offers “Smart Trunk,” which pops the trunk if it senses the driver’s key. So repair procedures could change a bit there.